From Turin or Susa: on national road SS24 heading towards Bardonecchia, after Exilles town at a junction turn on the right to Eclause – Grange della Valle. From this point continue for 8 km by car on a paved road to Grange della Valle: in the village live the car and continue on foot for about 15 minutes, with no rush. From Bardonecchia or Oulx: from highway SS24 after Salbertrand town, continue on the raising hairpin turns, then turn on the left to Eclause – Grange della Valle. From this point continue for 8 km by car on a paved road to Grange della Valle: in the village live the car and continue on foot for about 15 minutes, with no rush. Go until the Salbertrand station: there you can reserve a pick up service or walk. From Salbertrand railway station: follow the GTA itinerary n.541 until the village of Eclause, from there follow the paved road 258 to Grange della Valle (itinerary length: about 2h 30). From Exilles: on the paved road SS24 take the turn to the path running along the river Galambra. Follow the path and pass Grange Margheria, until you reach Grange Clot Sesian. Take the paved road SP 258 and reach Grange della Valle (itinerary length: 2h30). The shelter follows a seasonal opening. Open from MAY (beginning or according to snow conditions) until MID SEPTEMBER. From MID SEPTEMBER to MID OCTOBER open on the weekends and during the week upon reservation, for schools and groups. The shelter has a public telephone charge but inside the building there’s no mobile network. Vodafone is covering mobile network on the meadows area outside the shelter. The Shleter has 46 beds divided in rooms: 4 double rooms, 1 room with 6 beds, 1 dormitory with 32 beds. There are hot showers and common restrooms on the floors. Several day-trips can be organized on the mountains surrounding the house. 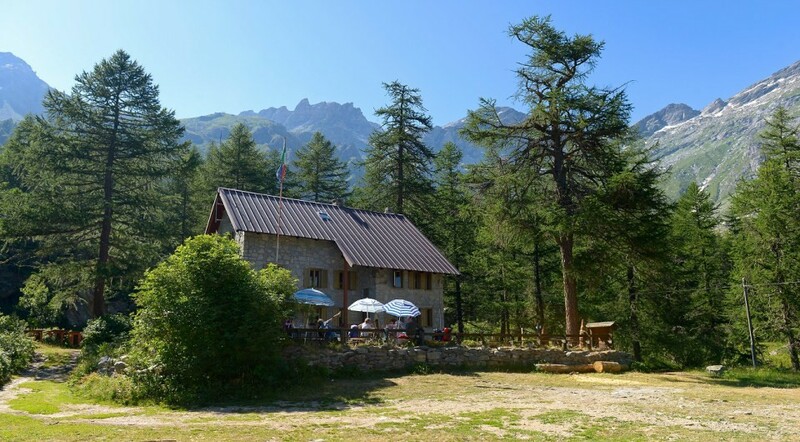 The shelter Levi Molinari is located in Piedmont, in the high part of Val di Susa, about 80 km away from Turin. Its part of the municipality of Exilles – hamlet Grange della Valle – and is at 1850 m altitude. It is situated in the basin of river Galambra that opens unexpected to the eyes of visitors, leaving Val di Susa in the most narrow and wildest point; here the valley is dominated by Mount Niblè (3365 m) and Mount Ambin (3264 m) which still hides the last glaciers, creating a “magic” place inside a Park where there is an integral preservation of the incredible variety of animal species that populates the Alps. The Shelter belongs to C.A.I. (Italian Alpine Club) Turin and was assigned for management to Tiziana Di Martino and Marco Pozzi, working partners and a couple…. infact in 2002 their son Didier was born and nowadays is an active and expert guide of the Park surroundings. [riquadro a destra] IN ANY PROFESSIONAL CURRICULUM WE WOULD QUALIFY OURSELVES AS NATURALISTIC GUIDES, BUT WORKING IN AN ALPINE SHELTER TURN ANYBODY INTO A COOK, CONFECTIONER, LOCAL PRODUCTS AS WELL AS HISTORY AND HABITS EXPERT OF THE VALLEY. As Naturalistic Guides we collaborate with the Park of Gran Bosco di Salbertrand organising trekking and stays, while as professional Educators we bring on the mountains and around them people with motoric or psychic disabilities. We like to think that a Shelter is a territory safeguard and it has to give opportunities to discover a thousand wonderful landscapes that mountains can offer us. We invite you to come and discover our culinary proposals too!! “The true discovery journey doesn’t consist of finding new lands but finding new eyes to watch them”.